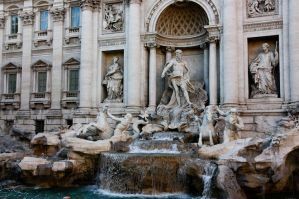 Rome is a city filled with history, architecture, art, and cuisine. It is a popular destination for families, school groups, or friends that are looking for a fun filled weekend. Whether you're traveling with a small group of your closest friends, or a class filled with eager students, Rome will not disappoint. The city is vibrant with lots of energy. It is one of the world's top tourist destinations, and as such, it has no shortage of accommodation options. Hotels, hostels, bed and breakfasts, and apartments are all available to travelers. Group accommodation can take many forms, but each option has it's own character and amenities. Rome is a city to immerse yourself in, and choosing the right accommodation is just the first step to ensure you have a great trip. 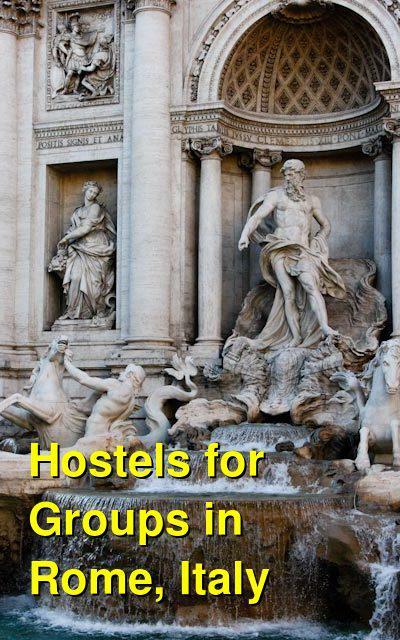 How much do hostels in Rome cost? Freedom Traveller Hostel offers four bed dorms with both shared and private bathrooms. There are also female only dorms available. Private rooms range in size from doubles to quads with both shared and private bathrooms available. This hostel is a good option for groups because of its social setting, large kitchen, backyard garden, and large rooms. For groups of more than 24, online booking is not available and the hostel should be contacted directly. Group bookings are not allowed for single nights. This hostel offers a great social atmosphere. There's a happy hour held every night between 7:00 pm and 9:00 pm when free wine and snacks are available. The hostel also has a book exchange and library as well as multilingual staff, city information, and a free, light breakfast. Free wireless internet is also available. The hostel is centrally located in Rome, just a five minute walk from the Rome Termini Station. The area is pleasant with many supermarkets, restaurants and bars nearby. It is also in close proximity to many of the city's most popular sights and attractions. The hostel is convenient and fun for groups of all sizes. Eurorooms is a family-run hotel that accommodates groups of most sizes. There are many rooms available of varying sizes, some with shared bathrooms and some with ensuite bathrooms. These rooms are large and comfortable, making them a great option for anyone looking for a central place to sleep. They offer internet access, hot showers, linens, luggage storage and lockers, and laundry service. The hotel is conveniently located just a few steps from the main railway station (Termini). It is near many of the city's major attractions and offers many amenities and tourist information for its guests. There's also a garage just a few minutes walk from the hotel, but private vehicles are not necessary because it is in close proximity to all forms of public transit. This hotel offers an excellent base to explore the city, as multiple metro stations are within walking distance, as are some of Rome's highlights. Seven Hills Village is set up as a campsite with cabins, but with all of the typical luxuries one can expect from a hostel. They have a beautiful pool, several restaurants and a bar, a dance club, supermarkets, pizzaria, laundry service, free WiFi, and more. The staff is helpful and friendly, and the entire place is very used to hosting large groups. And if you're concerned about the "camping" part if it - fear not because some of their cabins have ensuite bathrooms! Located in the hills of northern Rome, they also offer a shuttle service to the nearest train station, making the whole of Rome accessible via public transportation. The surrounding scenery is quiet, relaxing, and beautiful. This is the perfect location for those looking to have a calm and leisurely visit to Rome without spending a fortune.